The College of Education’s Counseling Program Coordinator, Gene Eakin, shares an impactful story about a veterinarian whose death was mourned for by a group of elephants. The veterinarian cared for the elephants, and when he passed away, the elephant herd was reported to have stood in front of the veterinarian’s house and bowed their heads. 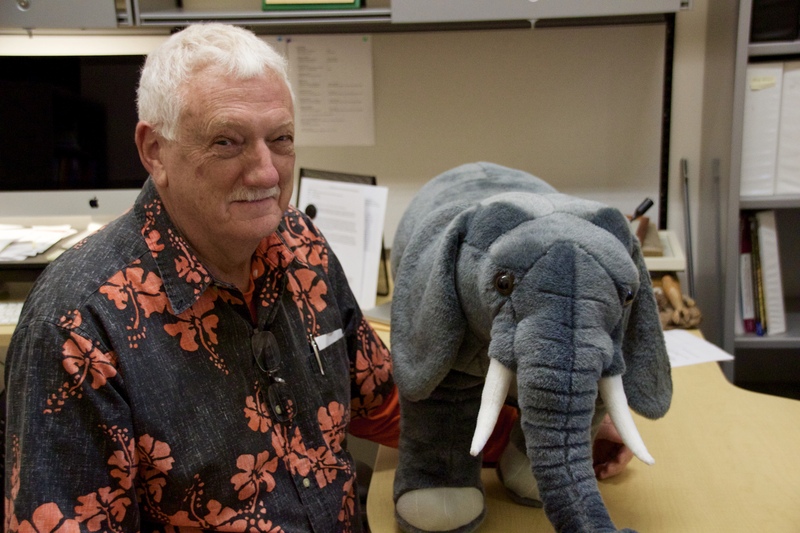 Eakin’s favorite animal is an elephant because he believes that “elephants are what counselors should be—empathic and caring”. This year we are congratulating Gene Eakin who has been awarded the 2017 Leona Tyler award. 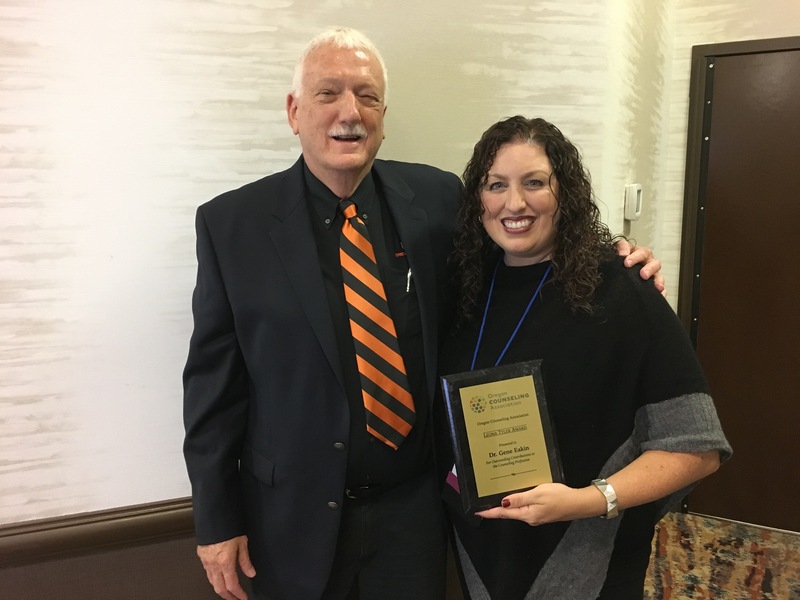 This annual award was established by the Oregon Counseling Association to recognize individuals whose work has had statewide implications for counseling. Eakin is the 8th person from Oregon State to receive the Leona Tyler award. Eakin has worked hard on both the state and national level to strengthen school counseling and connect people to the current issues that are especially found in K-12 schools. This past June, Eakin and his wife Twila celebrated 50 years as OSU Alumni. As an alumus and experienced counselor educator, Eakin is passionate about his work in the counseling program. He is proud to share that in the counseling hybrid program (online and in person), 31 out of 35 students were working full time as they started their third year in the program. 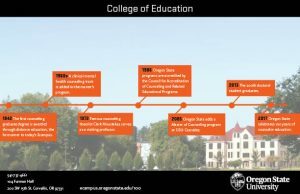 The hybrid format fulfills Oregon State University’s land grant mission in providing individuals from all areas of Oregon access to becoming a counselor. 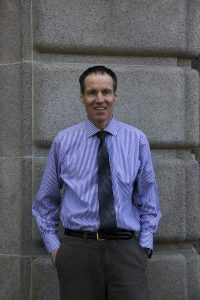 Eakin’s counseling work has spanned forty-two years in Oregon working at Lebanon High School, West Salem High School, Lewis and Clark College, and Oregon State University. 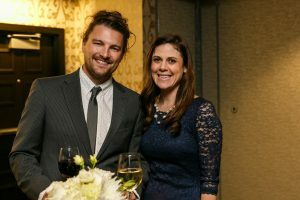 Being awarded the Leona Tyler award is unique and means a lot to Eakin, because previous award recipients have mainly been a part of the large population of clinical mental health counselors, and he is one of the few to be recognized for his work as a school counselor and school counselor educator. He hopes that this award will give him a platform to “speak to the mental health needs of our children and adolescents.” Going forward, we need counselors who will advocate for these needs and have the empathic and caring traits of an elephant. There is an increase in the number of elementary school students who need this support; as elementary school counselors across the state report that more and more students’ lives have been affected by family trauma related to the recession and the resulting family poverty. Eakin says, “there are a limited number of mental health counselors in most communities providing services to children and adolescents and Oregon, overall, ranks 49th in provision of mental health services to our citizens.” Eakin expressed that “we need more school counselors doing the good work that they do and more school social workers doing the good work they do in order for Oregon schools to increase attendance rates, graduation rates, post high-school education matriculation rates, and improve the behavioral and mental health of our students.” With Oregon’s student-counselor ratio (510-1) ranking 39th, Eakin vows that he will continue to advocate for the school counseling profession and for the work they do in meeting our youth’s career and college readiness, counseling needs, academic counseling needs, and personal-social-emotional counseling needs. challenges they were facing, from fears to family issues. “People seemed to be looking to me for help or advice,” Dec says. practice while pursuing a master’s degree. She credits her parents with influencing her overall career path. emphasized the golden rule,” Dec says. 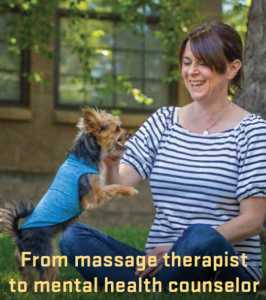 counselor at Bend Counseling and Biofeedback Inc.
“It was a little insane,” she says of all she did while working on her master’s. clear she loves her new career. 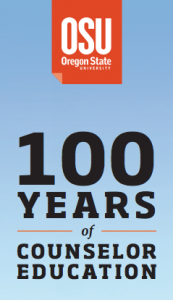 Oregon State has been educating them for 100 years. after Harvard University offered the first counseling course in the nation. courses expanded to include emotional and psychological issues. program of mostly in-class courses is offered at OSU-Cascades in Bend. 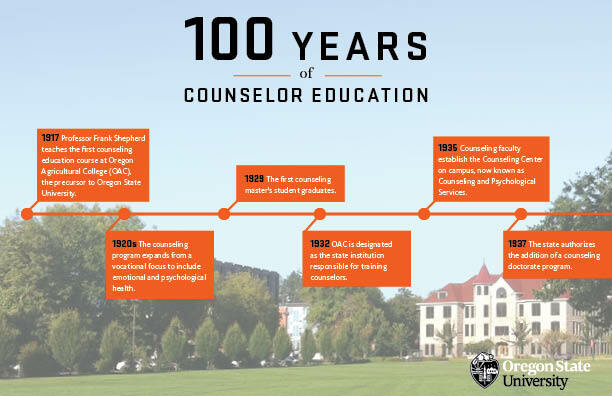 The counseling program at OSU has come a long way since the founder, Professor Frank H. Shepherd, taught the first counseling course during the Spring Semester of 1917. 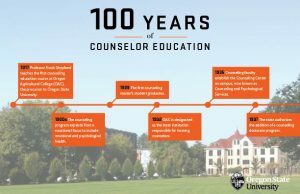 This year, Oregon State University’s College of Education’s Counseling program is proud to announce the celebration of its 100th anniversary. Entering the 100th year of counseling, Cass Dykeman shares, that “the centennial is a chance for all of Oregon to celebrate the pivotal role the citizens of the State have played in the continuous development of this profession, [which is] so vital to the health of the nation.” Cass Dykeman, the Associate Professor in Counselor Education at OSU’s College of Education, has been a part of the program’s development since 1998. In 2014, Bolante graduated from Oregon State University with a Ph.D. in Counselor Education and Supervision. 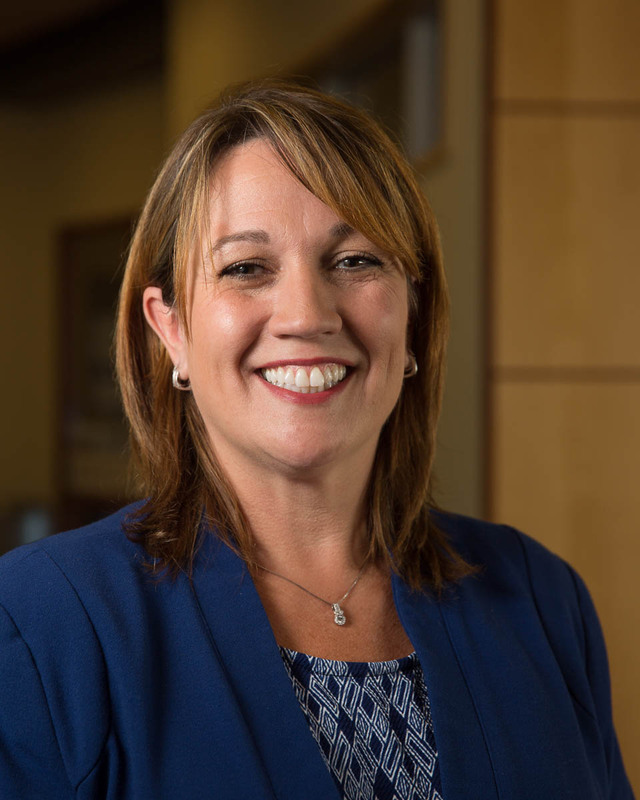 Bolante continues her work as the Director of Threat Assessment Management programs at Chemeketa Community College in Salem, Oregon. Along with her Ph.D., her education background includes a Master’s degree in Rehabilitation Counseling and a Bachelor’s in Psychology with a minor in Criminal Justice from Western Oregon University. Bolante was first introduced to the counseling program here at OSU when one of her professors spoke highly of the program. The flexible, hybrid program including both online and on-campus classes was perfect for her needs. Working full time and as a mother made finishing a degree more challenging, but her passion of caring for others, education, and research propelled her to earn her degree. With her research on threat assessment, she learned the best tactics to prevent violence and continues to share these techniques with various professionals like counselors, law enforcement, human resources, and legal counsels . “The key to threat assessment”, she says, “is a team approach”. Overall her research created the Threat Management Resources program at Chemeketa. This program focuses on three parts: prevention (threat assessment), what to do during an event, and disaster behavioral health recovery, and can result in a certificate. Currently, Bolante’s work at CCC is filling the need to provide the support, education, and training in Threat Management for working professionals. The program has even expanded to places outside of the state to provide the training where it is needed. Bolante’s work doesn’t just engage with the national conversation about mental health and safety nationwide, she contributes to it. At the beginning of her research she thought that all campuses had threat assessment teams, given they are highly recommended by the Secret Service, FBI, and the U.S. Department of Education. In reality, most colleges and communities do not have someone like Bolante to help facilitate the aftermath of traumatizing events; however, she hopes that her workshops on how to set up a response room, to-go box, and other trainings will help see an increase. She believes campuses should all have threat assessment teams because “there is a need and it continues to grow”. Fortunately, here at Oregon State we have our own Threat Assessment Team with Oregon State Police lieutenant, Eric Judah, co-founder of the team, who also assists Bolante with various training. After learning about the College of Education’s new Master of Counseling in Clinical Mental Health program, Bolante expressed interest in the online aspect. She shared that her last part of her academics was online and although she originally questioned how it would work out, she stated that “the online experience went very well…[because] it is very efficient to handle the details. I can see how it would benefit counselors in training”. Some improvements that Bolante hopes for the future is more work in counselor education involving threat assessment and disaster behavioral health. Bolante admits that she “made an assumption that counselors have training [in disaster response], and although there is more now, it is a different skill set with emphasis on psychological aid.” She also emphasizes the importance in education about spirituality and belief systems because they play a significant part of responding to disasters since “people’s belief systems oftentimes get confused and unsure during these times”. One thing she loves about her job is seeing people “get off the pathway to violence and receiving positive support”. Bolante shares that “if we could learn more about the warning signs and report them prior to an incident we could reduce mass violence.” With work keeping her busy and oftentimes dealing with dark topics, she knows how important self care is and enjoys gardening, music and family time. Bolante is fortunate to have her hard work and determination supported by her family, husband, and children. Another person who is a continuing supporter of Bolante’s education and work is Dr. Cass Dykeman, a faculty member in OSU’s Counselor Education program. Bolante says that he has “been a champion for these initiatives” and together, they have created recent publications; including one this year. Oregon State University will be well represented at the Association for Counselor Educators and Supervisors (ACES) National Conference in Denver, Colorado from October 16-20, 2013, with approximately forty students, alumni, and faculty members presenting during the conference. The goal of ACES is to improve the education, credentialing and supervision of counselors working in all settings of society. The association also strives to encourage publications on current issues, relevant research, proven practices, ethical standards and conversations on related problems. Counselors often find leadership opportunities through ACES.